* Isaac Asimov, SF legend, contributes one of his last, and best stories in "Gold..."
* Connie Willis, already a multiple Hugo and Nebula award winner, offers two unique stories: In "Even the Queen," the Women's Revolution revolves into a new cycle. And in "Death on the Nile," Agatha Christie meets the Twilight Zone for a tourist in Egypt. 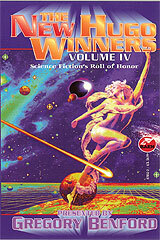 Hugo-winning stories by Harry Turtledove, Nancy Kress, Lucius Shepherd, Janet Kagan, and Geoffrey A. Landis. "World Science Fiction Convention" and "Hugo Award" are service marks of the World Science Fiction Society, an unincorporated literary society. "Gold" by Isaac Asimov. Copyright © 1991 by Nightfall, Inc. Reprinted by permission of the agent for the author's Estate, Ralph M. Vicinanza, Ltd.
"Beggars in Spain" by Nancy Kress. Copyright © 1991 by Davis Publications, Inc. First published in Asimov's Science Fiction. Reprinted by permission of the author. "Even the Queen" by Connie Willis. Copyright © 1992 by Connie Willis. First published in Asimov's Science Fiction. Reprinted by permission of the author. "The Nutcracker Coup" by Janet Kagan. Copyright © 1992 by Janet Kagan. First published in Asimov's Science Fiction. Reprinted by permission of the author. "Barnacle Bill the Spacer" by Lucius Shepard. Copyright © 1992 by Lucius Shepard. First published in Asimov's Science Fiction. Reprinted by permission of the author and his agent, Ralph Vicinanza, Ltd.
"Death on the Nile" by Connie Willis. Copyright © 1993 by Connie Willis. First published in Asimov's Science Fiction. Reprinted by permission of the author. "Georgia On My Mind" by Charles Sheffield. Copyright © 1993 by Bantam Doubleday Dell. First published in Analog Science Fiction and Fact. Reprinted by permission of the author. "Down in the Bottomlands" by Harry Turtledove. Copyright © 1993 by Bantam Doubleday Dell. First published in Analog Science Fiction and Fact. Reprinted by permission of the author. Introductions copyright © 1997 by Abbenford Assoc.